Investing in a quality, easy-to-use moisture meter can have a big impact on your business, but with seemingly countless options, choosing a moisture meter that is right for you can seem challenging. There are different types of moisture meters for different tasks, and each one has its own set of features and capabilities. Kett began years ago with our Riceter, which is lightweight, portable, easy to use, has an two second measurement time, and is powered with four “AA” batteries. When we developed the Riceter, we wanted a moisture meter that could be used anywhere: from a steamy rice paddy to a dry desert. 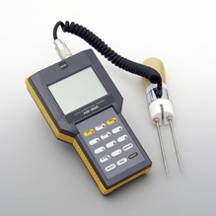 Seeking a moisture meter for various types of flour? We have handheld moisture meters for both rice flour and wheat flour that are lightweight and simple to use. Another thought to keep in mind, if you need a moisture meter with varying types of calibrations, you will want to seek out a moisture meter that offers an array of them, like our PM650 Instant Grain and Seed Moisture Meter that has a long list of calibration settings from basic grains to eggplants to melons, that may fit your needs perfectly. Near-Infrared (NIR) moisture meters are versatile, as evidenced by the wide range of industries that have found NIR meters to be the right choice for them. NIR meters are used in food and grain processors, the tobacco industry, in pharmaceuticals, in the creation of pulp and paper, with minerals and personal care products, with chemicals, and textiles. Its versatility is highly appealing, it’s nondestructive when conducting readings, and can be used on almost any liquid or solid. NIR moisture meters are offered in handheld, desktop, and online or inline varieties, again adding to their versatility. A NIR meter is quick to calibrate to your specific needs and can give your company a big boost because it is so fast and easy to use. Many find that using near-infrared technology is also helpful in freeing up time for personnel, as compared to Loss-on-Drying meters (LOD), or Karl Fischer (KF) testing since the wait time is dramatically decreased. While choosing a NIR moisture meter can be a big investment, if you are using a moisture meter with high frequency and need the speed it can provide, it may be an investment worth considering. 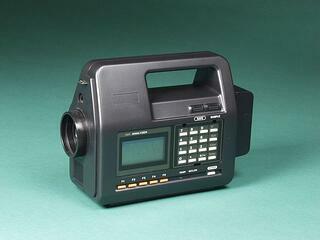 Our list of moisture meters doesn’t just stop with agricultural moisture meters and NIR meters. We also carry paper moisture meters necessary for paper mills to avoid curling, concrete meters and non-destructive wood moisture meters perfect for the construction site. With such dense materials like paper or pulp, concrete, or wood, having an accurate reading is vital to the successful creation of your final product. Beyond these specific moisture meters? We also carry a universal moisture meter if you need a programmable moisture meter that can calibrate to suit your specific products. In fact, each universal meter can be calibrated for up to 10 different materials, allowing you the freedom to use your universal moisture meter for all of your needs. Still unsure which moisture meter is the best fit for you, or have more questions about what moisture meter best fits your company’s needs? We at Kett love to help find the right meter for each company. Contact us today to be sure you find a moisture meter you will be satisfied with day in and day out.